A Wizard precision deluxe sewing machine, made in Japan. This wizard sewing machine is a beautiful example of mid century craftsmanship, and I had to have it. With only a few dings in the paint, the nearly 60 year old precision deluxe is wearing a 57 chevy two tone color scheme with gold and chrome accents making it stand out from some more common utilitarian sewing machines of it day. 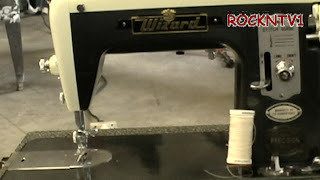 While information on the wizard precision deluxe sewing machine is sparse, It has been said that these sewing machines were sold by the Western Auto stores and bought by brother. The machine seems to have had little use and probably lived in a basement storage, were the portable case collected dust and grime. After about an hour of cleaning and oiling, I plugged the machine in to see the old wizard precision deluxe come to life in shiny glory, light and all. This antique sewing machine seem to need nothing more than a new belt, at which 50 years has taken its toll.